School is out, summer is here and it’s time for vacation! 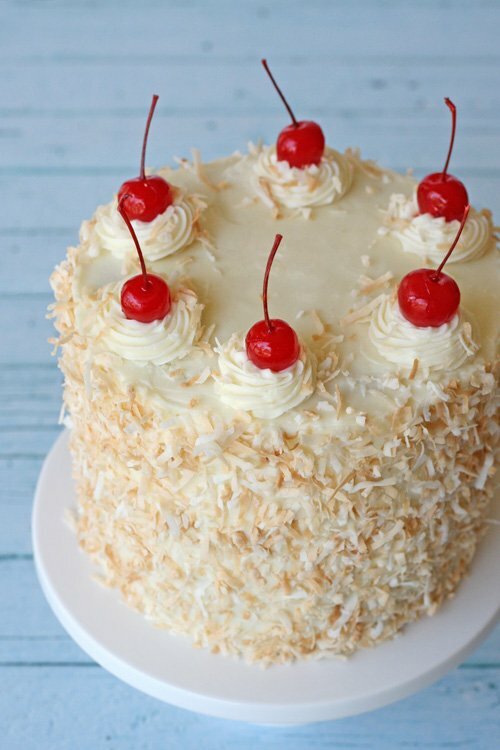 I don’t have any beach vacation plans… but with this delicious Pina Colada Cake I can enjoy a tropical flavored treat right at home. 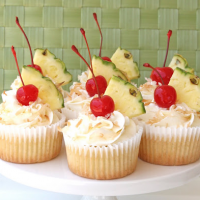 I’ve shared my recipe for Pina Colada Cupcakes before, and have been wanting to make a cake version for quite a while. I’m so happy I finally made it! This cake is moist, rich and flavorful. 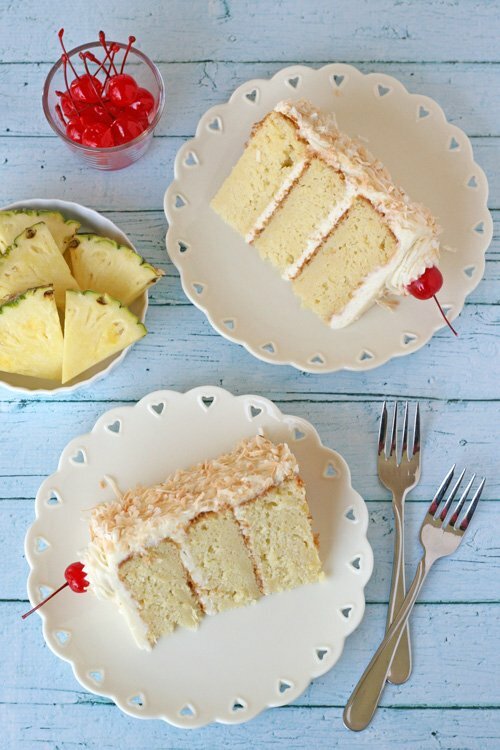 I’m guest posting over on Tidy Mom today and sharing the recipe and all the details on this Pina Colada Cake. Head on over and say hello! 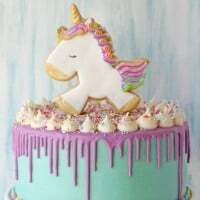 This cake looks amazing and I bet it taste great!!! The “head on over” link works fine. Oh, h**l yeah. Gimme a piece of that. I’m totally into Cocktails, so a Cocktail-Cake is absolutely my kind of cake. It looks delicious. It’s a beautiful looking cake! Yummy! summer in a mouthful! I’ve made this cake the opposite way: Coconut cake with pineapple curd in between the layers. So, so delicious! Oh Glory, this looks just fabulous! I wish I could have one of those slices right now! Yuuuum! Need this for summer! The crumb in this cake looks fantastic! Yuuum!! Looks amazing! I want a bite! Such a gorgeous, fluffy and light cake – I love the flavor! Great job! Heck yeah! I love this! Fantastic cake. Made it this past weekend for a friends’ birthday and it was a huge hit! I made this cake for my husbands birthday on the weekend and it was beyond delicious!! By far my new favourite cake. Thanks for the great recipe!! You were right, your treats are simply GLORIOUS! I made this wonderful cake this week for my kindergartener’s graduation party and it was a Huge success with the grown ups! So moist, and delicious! And let’s not talk about the frosting, OMG! The only issue I had its that in living in Southern California I know its always warm and sunny so the cake spent a lot of time in the fridge, so it got a bit hard, but still Delicious. Thank you for this great recipe, I feel like I know you, all the recipes I’ve made from your blog have been delicious! 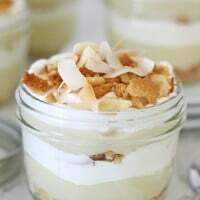 HIhi, i was gonna make this in the afternoon for my bosses’ dad’s birthday and i was wondering if i could use coconut cream instead of coconut extract and heavy cream. i live in trinidad, so there are a lot of coconuts available at my disposal and id prefer to use it, rather than an extract. Do you think it will work? can this cake be made without the rum? if so what would i sub? There is no rum in the cake, and the rum listed in the frosting has heavy cream listed as the optional substitute. Happy baking! 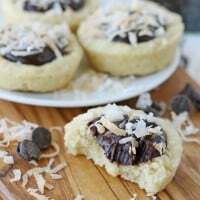 Hello, the recipe looks awesome, but I wanted to know what kind of flour should I use?